Puppies are a huge responsibility. You need to bathe your dog, protect your dog against toxins, brush their teeth, decide whether to get pet insurance and clip their nails. Of these, clipping the nails often brings the most anxiety for the dog as well as the human. Included are tips on how to hold the dog while clipping, how to clip the nails properly, and what to do if you accidentally cut the quick and your dog starts bleeding. Prepare Your Puppy for His First "Peticure:" It is ideal to begin clipping your dog's nails while he is still a puppy so that he is used to it by the time he is an adult. Sometimes this is not possible, but that doesn't mean you should forgo cutting the dog's nails altogether. 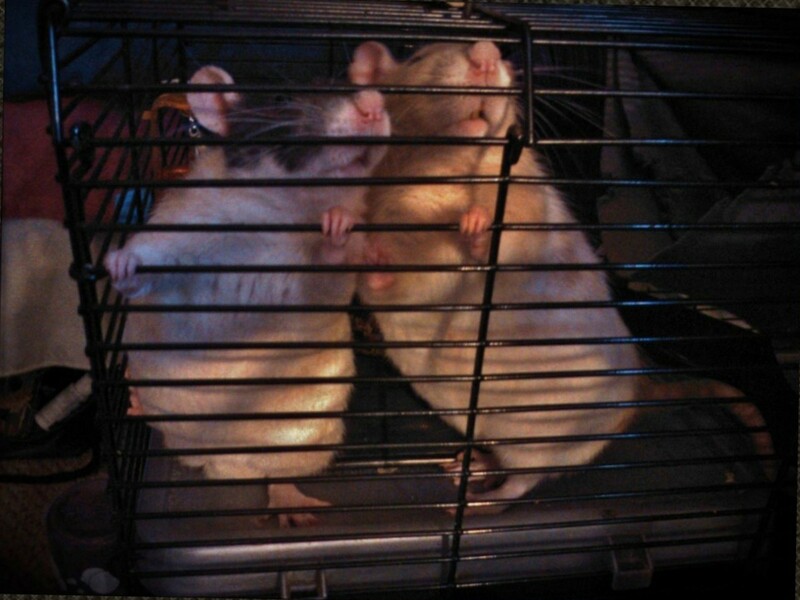 It may take longer to get them used to clip their nails, but well worth it. The most important part of preparing your dog is getting them used to touching their feet as well as extending out each claw individually. As they get used to this, progress to putting a little more pressure, until you have complete control of their paw, just as you would while clipping their nails. Anytime your dog gets agitated, pet him and praise him. Once the dog allows you to handle his paws, bring out the clippers, and watch his reaction as you bring the clippers closer to his paws. If he gets agitated, hold the clippers near the dog for at least thirty seconds while praising and petting him. Then repeat this step the next day, until he is okay with the clippers. If he doesn't react or just seems curious, then it is okay to proceed onto cutting the nails. This may take a couple days to a few weeks before he is comfortable enough to let you clip his nails. Typical Behavior and How to Handle It: When dogs are in a pack, they fight to be the alpha dog. Often times when trying to gain dominance--especially when they are afraid or nervous--they will growl, bite, or nip to gain status. As you try to cut his nails, he will feel vulnerable; therefore, he may try to assert his dominance. Assuming your dog is not aggressive, the growling and nipping can be deterred by proving that you are dominant. Growling: If your dog tries to growl at you as you clip his nails, then make it clear that growling is not acceptable. They need to understand that you are the alpha dog. This can be done in several different ways. Personally, I grab the scruff of his neck and say "no growl." You need to make sure your grip is firm but not harmful. If your dog does not submit to this command, then you may actually need to work on obedience with your dog. Through obedience classes, he will learn to be submissive to you, and will less likely try to assert his dominance. Nipping: Another common behavior your dog might show is to try to nip at the clippers or your hand. 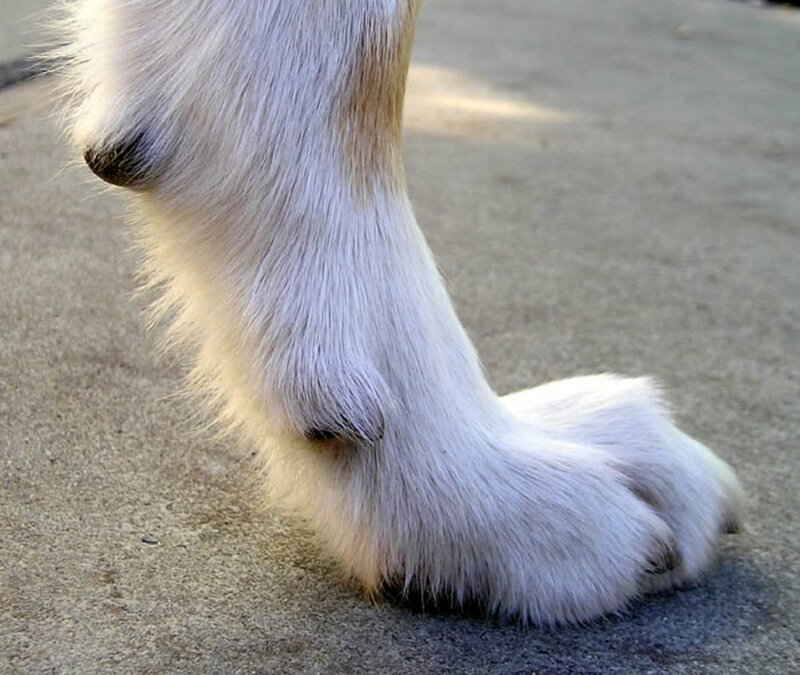 Most dogs are not trying to bite you, but show you that they do not want you near their paws. There are a couple of techniques you may want to do. The first is to find a distraction. Treats are a common distraction. My dog resisted any attempt at a treat. As soon as I got near his paws, he didn't care how yummy the treat was, he did not want me near his feet. In this case, peanut butter is an ideal distraction, because it takes them a while to swallow it, plus they absolutely love it. When I first began clipping my dog's nails, I did not know the peanut butter method; therefore, I chose to use a muzzle. Keep in mind, a dog does not like a muzzle, and should not have it on for an extended period of time. On a side note, a muzzle should never be used to keep a dog from barking, but only as protection for themselves or others. When cutting your dog's nails, it will take less than five minutes, which is an acceptable amount of time to leave a muzzle on a dog without being cruel. The dog will still try to nip at you, but they will be unable to. After several months with the muzzle, I now can easily clip his nails without any method of distraction, accept praise and pats. Distracting the dog is only a portion of what you need to know in order to clip the dog's nails. You need to be able to hold its paw firmly without causing harm. When you press slightly down on the paw, their claws will extend. Dogs who have white nails, it is very easy to see the quick. The quick is the pink section of the nail. If it is cut, then the claw will bleed, because it is filled with veins. It is important you are prepared ahead of time in case this happens, which I explain at the conclusion of this article. Dogs with darker nails are much trickier since the quick is not easily seen. You can tell where it is by how the nail curves. When the nail starts to arch downward is where the quick ends. 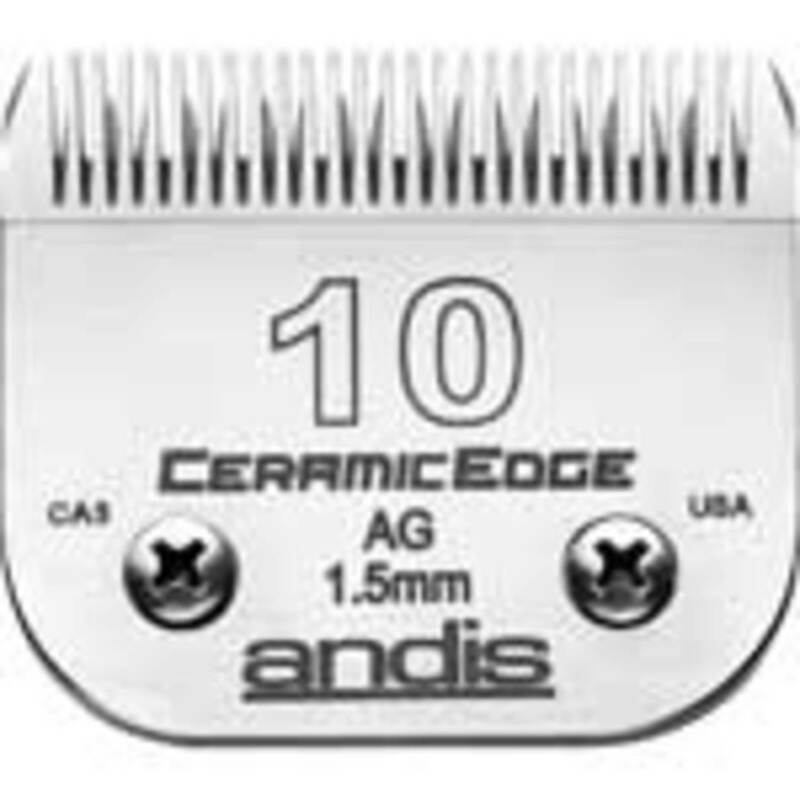 If you are unsure, only clip a little bit off at a time. Once the nail is short enough, you will see a dot at the tip of the nail that signifies you have reached the quick. Any further will cause pain and bleeding. This dot is also seen in dogs with lighter nails. Some believe that the more you clip the dog's claws, the shorter the quick becomes. I am unsure if this is true, but it does make sense. This would indicate that it is a good idea to trim their nails often; I recommend at least once a month. Some choose to do this once a week when they give their dog a bath. Many people are able to set the dog on a counter or table, so the dog's nails are close up and they can get at them well. Others will get down on their level. 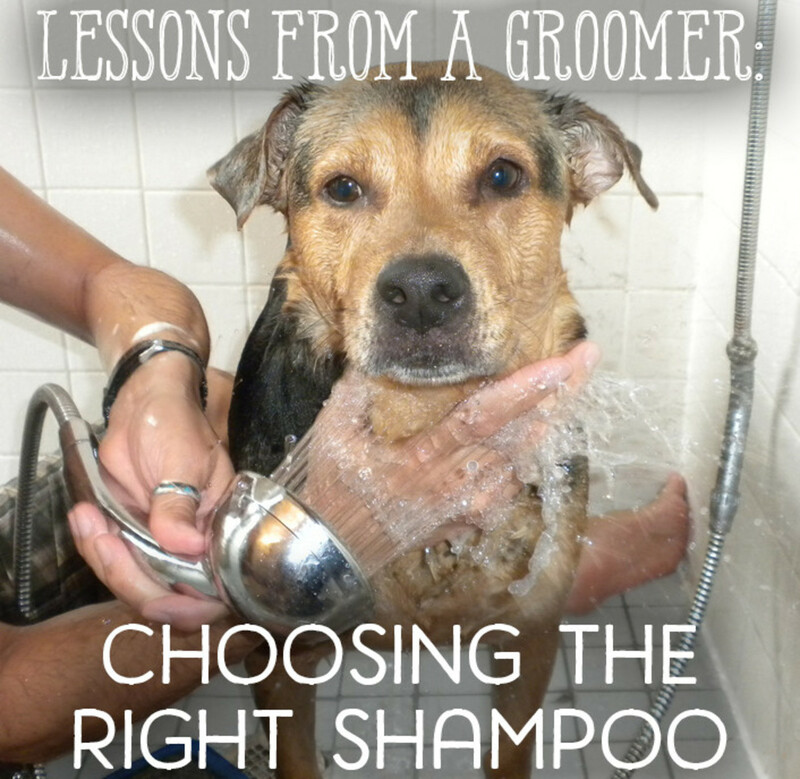 I choose a very different method with my small dog that makes it quick and painless. Tuck and Dangle Method Used for Smaller Dogs: In some ways, small dogs are easier than larger dogs when trimming their nails, due to their weaker status and smaller size. 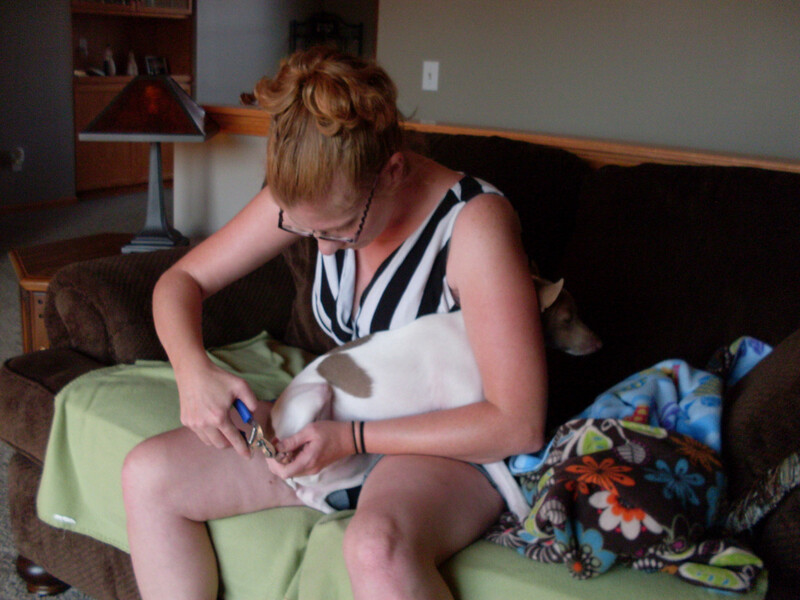 Unfortunately, small dogs can easily slink away and are more apt to nip at you while clipping their nails. One method that works well, especially to get the front paws, is the Tuck and Dangle Method. You tuck your puppy under your armpit so his legs are loose but his body is firmly tucked under your armpit. He will feel vulnerable in this position making him more docile and willing to allow you to clip his nails. It is important that the dog is small enough that you will not accidentally drop him. Once your dog is securely under your arm, take the front paw and clip just the very tip of the point off. It should take less than two minutes to get all front claws. The back feet will be trickier, but not impossible from this position. Ideally, you could have someone else get the back paws in this position. If not, place the dog in your lap, and use the same method used for a larger dog, which is explained next. 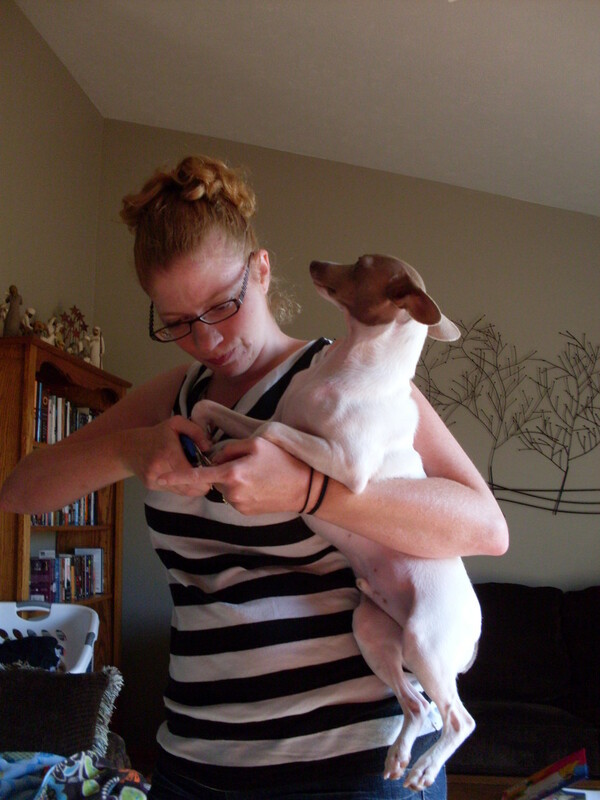 Headlock Method: This is a good method for most dogs that will not stay still while clipping their nails. Larger dogs may require a second person to help you clip its nails: one to hold the dog still, the other to clip nails. One of you place the dog in front of you and tuck his head in your armpit so your dog's face is pointing behind you. The person holding the dog should talk very soothingly to the dog and pet him. If there is a second person, they should quickly clip the dog's nails. With smaller dogs, one person should be able to do this with ease. I can clip my dog's back claws in less than two minutes with this method. What to Do When You Cut Toenails Too Short: Before you begin clipping your dog's nails, you will want to have a solution that will stop the bleeding. I use Nail-Safe Styptic Powder, another favorite of many is QuickStop Styptic Powder. If the dog's nail begins to bleed, immediately place the styptic powder on the nail, and be sure to cover the entire nail. Then, take a cloth or several paper towels and press firmly on the paw until it stops bleeding. Do not check on the progress of the bleeding, because this may take away the cells that are forming the clot. If he bleeds through rather than replace the cloth, add another one over it to allow the clot to form well. Usually, one minute is sufficient, but I would recommend leaving it on for a little longer if your dog allows. Throughout the process, the most important part is to remain calm. Dogs are much like children, in that if you get excited, they will get excited. You can buy styptic powder at most pet stores. I buy mine at a shop that clips dog's nails professionally. They sell it to me for ten dollars a bottle. Most places sell it for more. If you are unable to find styptic powder, you can use corn starch instead. I am unsure of the effectiveness of this since I have chosen to stick with styptic powder. One drawback of using cornstarch is dogs will want to lick it off. My pug wiggles tries to get away and screams bloody murder when getting his nails trimmed. He is so bad that even the vet techs can barely get through it. It takes two to hold him and one to clip. He is 5 and it has been this way since he was a pup. She mentions everything except how to clip the nails!!! AWESOME info!!! My new 8 month old 45lb dog is very well behaved but won’t stay still and herder nippy. I think the peanut butter may do the trick (and a 2nd person). THANKS!!!! Very good information here and interesting, too. Well done. Voted up. I don't have a dog, but if I do get one some day I will keep this great information in mind. 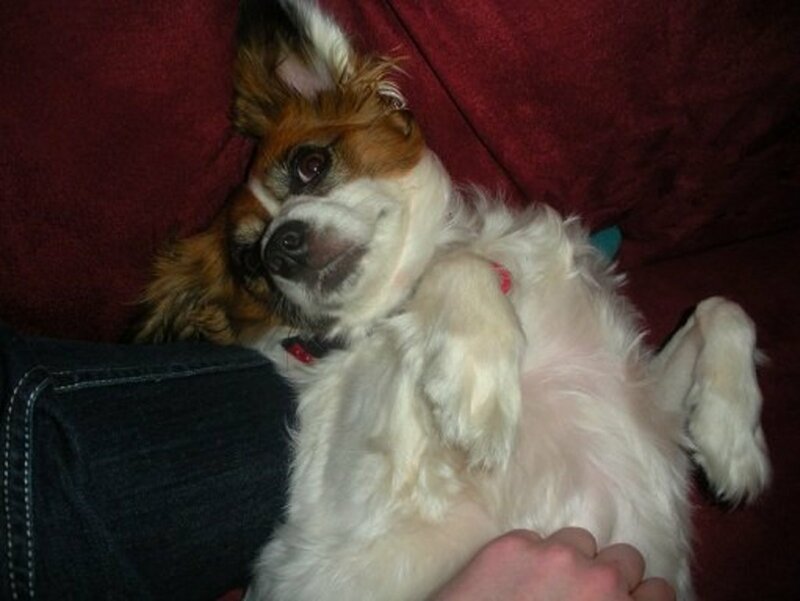 I do have a sister who trims her dog's nails as you suggest and he is a very happy pooch! That's good to know, I'm glad to hear that. Have you tried someone holding him in the headlock hold while you click his nails.? Excellent tips for how to trim a dogs nails. I have no problems trimming my female dogs nails but my male does not like to have his feet touched by anyone. Because he is around 160 pounds I find it impossible to hold him. I get someone else to do it for me. When I worked for a groomer/kennel we would use corn starch and it really does work. You would need to take it slow, so she gets used to you being around her paws. Dawn Morrison that is a really good suggestion. Thank you for sharing it with me. 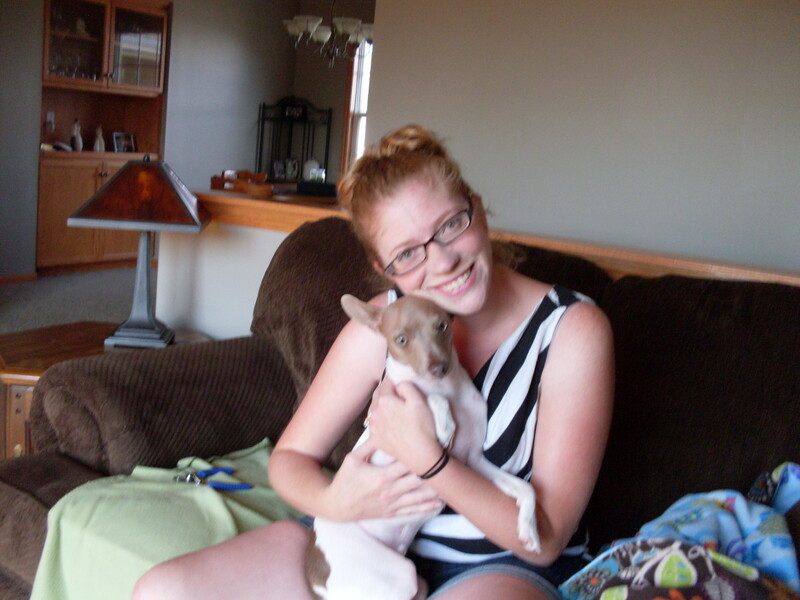 Sharyn, my dog was pretty horrible at first as well. That's how I came up with several of those tips. I do believe there are the dog's that need to be brought to a professional that has the right tools. There is a place down the street from me that only charges five dollars. That's a really good deal and worth it. But I prefer to do it myself to save the five dollars a month. Epecially since I've learned how to keep my dog calm while doing it. With the muzzle which I should probably explain in the article, they will bbe a lot like a horse who is getting a saddle on for the first time. You kind of have to let them get their anger out of their system first. Then they get used to it. The more they wear it, the more they get used to it. Great Hub! I do use cornstarch, and it works pretty well. One suggestion I would give people who have dogs with white/clear nails is that having a strong lamp or taking them out in the sunlight makes the quick much easier to see. Of course, if they have black nails, you have to "shave" the nail off in tiny increments, just as you said, until you see the end of the quick. My chihuahua has clear nails and doesn't mind having his nails trimmed, so I can get it done in a few minutes. My schnauzer has black nails and has severe anxiety over anything involving grooming. We usually try to take him for a long walk before trimming his nails or giving him a shave so he has less energy to wrangle with us. 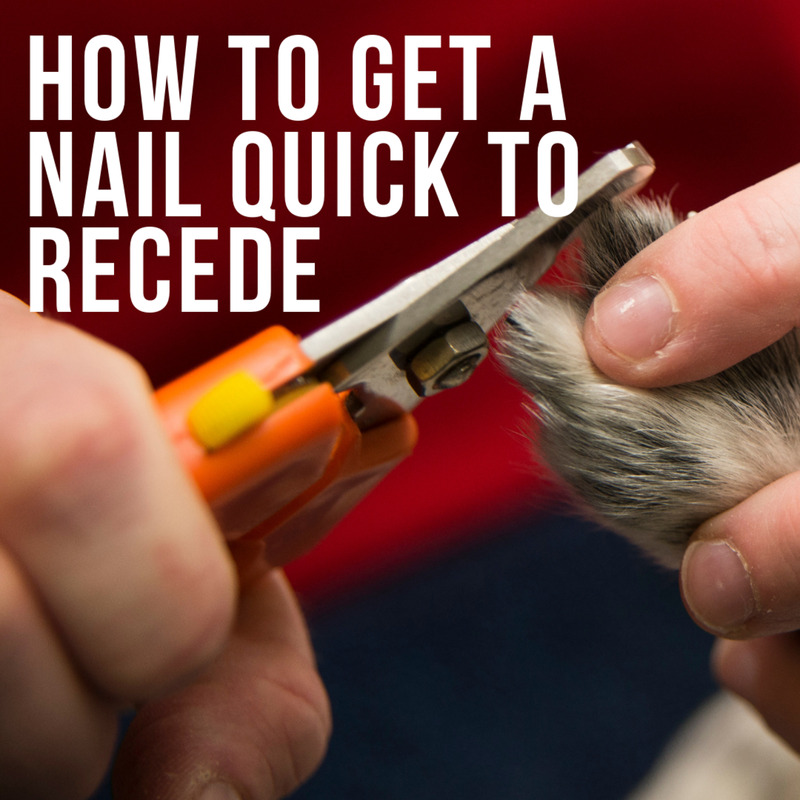 I have been through the nail trimming "process" on dogs and cats many times. For me, it's not as easy as it seems. Currently my Dad's dog is so horrible anytime you get near his paws. I have tried a muzzle which really makes him scared and angry. 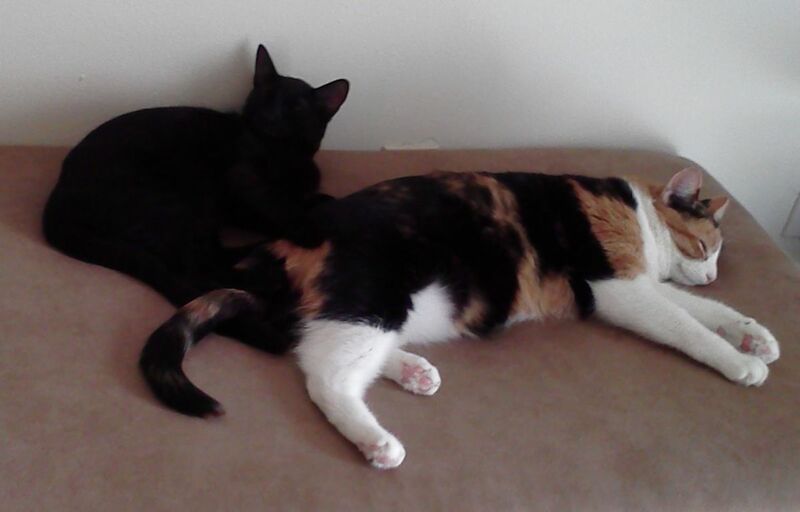 And my cats give me a really hard time too. I always have to ask someone else to hold them while I clip. It ends up being a big process. I have no doubt this is because these animals are rescues and are not used to this and also, it wasn't started when they were babies. I appreciate the information and tips.